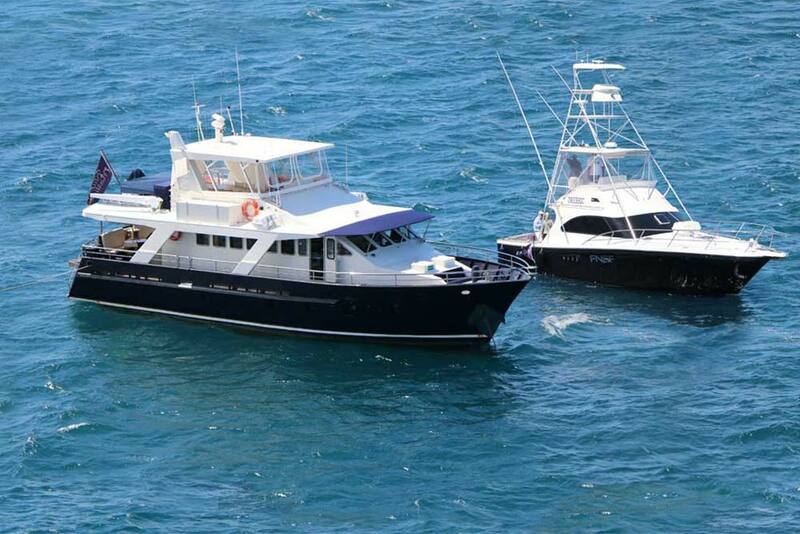 Port Douglas Reef Charters has an exciting opportunity for an amazingly well priced luxury marlin mothership fishing package. Representing a saving of over 20% on the usual price of our luxury fishing tour, at only $7500 per day you can take 6 fishermen in your group for a minimum of 4 days. The price of $7500 for our mothership fishing package includes all meals, crew, heavy tackle fishing equipment and linen on both boats. This price is unbeatable value. The only thing that is not included in the price for the fishing tour is alcohol, but the boat is fully licensed and has an amazing selection of cellared wines on board. Live aboard the beautiful 70 foot mothership in comfort and style, then fish for Black Marlin from our super fast 40 foot Black Watch boat during the day. Your experienced crew live to fish! Our luxury mothership fishing boat provides the perfect combination of luxury and comfort for extended mothership fishing charters to the prime fishing locations. Our luxury marlin mothership fishing boat has three separate levels and multiple lounging areas to relax in. Whilst on our luxury marlin mothership fishing boat your on-board chef will create delicious meals for your group. The luxury mothership fishing boat can sleep up to six guests in air-conditioned cabins across two queen cabins with ensuites and two twin share cabins.Full daily housekeeping service is provided aboard our luxury marlin mothership fishing boat as well as a good selection of water sport equipment. As regards the 40 foot Black Watch game boat that is included in our marlin mothership fishing package- it provides the perfect platform for heavy tackle fishing. The game boat is equipped with state of the art tackle including custom-built rods as well as the best Shimano and Penn reels.